Over the last 10 years arts in health projects have included intergenerational, reminiscence and dementia, quality, consultation, and peer education work. These have been for organisations such as local authorities, private health providers and voluntary sector organisations, such as British Red Cross and Age Concern. Perton Manor Care Home. Part of the Living Room project with Creative Health CIC, 2015. 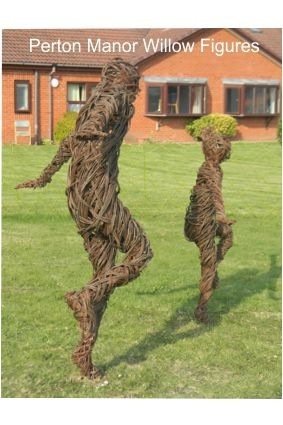 This project created a social space in the grounds of the home, whose residents have varying forms of dementia, with a living willow fence and arbors enclosing a pair of willow figures. These figures represented an adult playing with a child, representing returning to being a child. The pair are playing aeroplanes, as many of the residents might have as children, but also linking with nearby RAF Conningsby whose air show the residents watch every year. · The 5 Ways to Wellbeing were used as a framework for enquiry. · Approach to questioning included : open ended questions, prompt cards, visual stimulus, reminiscence (approaching wellbeing from the participant’s reference point), indirect questions (what would I/or visitor enjoy best at this setting? ), and comparable questions (how does your experience compare to the scene in this photo?). · The work was a mix of producing literal products (what does your experience look like?) and conversation that emerged from the process of working that had no direct relation to the finished product. The approach was flexible and open ended, with no pressure on participants to produce a product. Sessions allowed residents to dip in and out or simply to watch. · The process was open to both people with dementia and their relatives as both have differing views that need to be heard. · Sessions were accessible as possible and took into account location, time, language used, type of activity, resources used. Adjustments were made during the project when needed. · Time was taken to research the participants to consider issues such as communication, backgrounds and interests. This fed into a flexible approach where resources and activity was matched to the individual participants. The individuality of the participants was recognised and celebrated by the process, and that dementia affects different people in different ways. · The process endeavoured to provide a safe place for the activity, both physically and emotionally. It respected the participants feelings and temperament on the day with a dynamic and flexible approach to the interactions. In each of the settings the residents and staff worked together on a permanent collaborative work, drawing on their ideas from across the sessions. This was driven by the recurring theme of flowers and of representing people at Drovers as different flowers– bright, colourful, and all different. The preparatory work included tile painting (which were traced onto the perspex ) and large 3D flowers created from plastic bottles. It was placed outside to make the outdoor space even more inviting to visit. This emerged from ‘F’ ‘s interest in his role outside, watering the flowers. 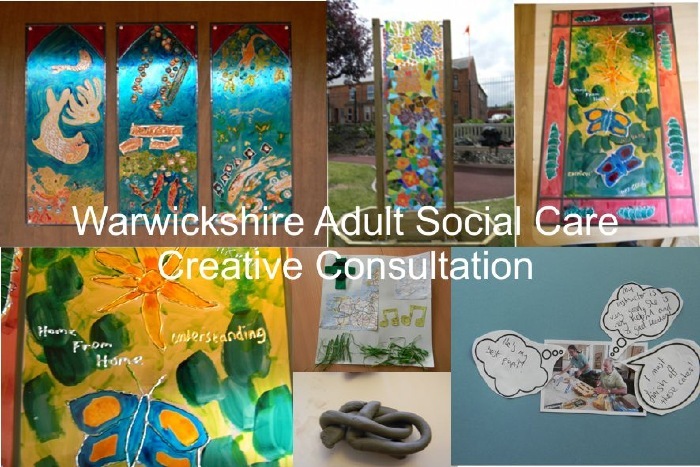 The butterfly and caterpillar motifs were from images ‘A’ had produced, and this supported the notion of growth, transformation and development of residents and carers that Merevale strives for. In the border, between the caterpillars, ‘N’ drew his knots, symbolising the friendships and connections within the setting. Further involvement was created by carers asking the residents for short descriptions of Merevale: ‘Excellent’, ‘Wellbeing’, ‘Home from Home’, ‘Very Good’, ‘You do like it’, ‘Remember’, ‘We Have This’, and ‘Ours’, were amongst the responses. This developed from the interest in the pond, and spending time there. It was placed in the summer house where they sit. The arch shape was from ‘R’, who likes stained glass windows. The words ‘contented’, ‘soothing’, and ‘relaxing’ were thought of by the residents to best describe what it felt like beside the pond. 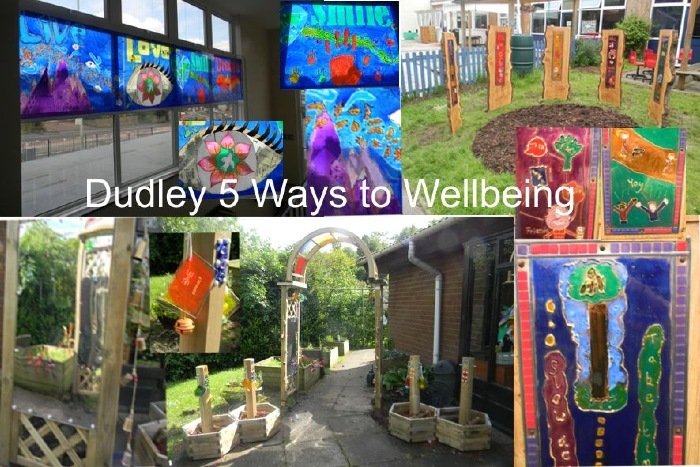 This project worked with different schools across Dudley to find out through creative activity what the 5 Ways to Wellbeing meant to them. The outcomes would feed into a process which would look at how the 5 Ways could be communicated to young people. For Penn Meadow special school we created a sensory arch, with aspects of the 5 Ways represented by Makaton. Year 9 of Pedmore Technical college created a glass painted window piece around the concepts of 'Live, Love, Smile, Dream'. Year 4 of St Marys Primary school worked on copper and oak to represent their interpretations of each of the 5 Ways.